The Pentagon is preparing for a new request from the Department of Homeland Security that could extend the U.S. border support mission beyond Dec. 15, according to two U.S. officials. A new request means some troops could be extended, but the officials indicated that an extension could also take form as a rotational deployment -- meaning different units would regularly rotate into the border support mission. A Department of Defense spokesperson told ABC News on Thursday that the Pentagon has not received any additional requests from DHS at this time. U.S. Soldiers and Marines assigned to Special Purpose Marine Air-Ground Task Force 7, practice non-lethal crowd control drills at the Calexico West Port of Entry in Calexico, Calif., Nov. 27, 2018. Defense Secretary James Mattis said he couldn't "forecast" if there would be an additional request to keep active duty troops on the southern border, but the Pentagon would "react to the Department of Homeland Security if they ask for it." Speaking to reporters outside the Pentagon on Wednesday, the secretary said that the hardening of ports of entry were "pretty much, I think, done." "There's a little on the flanks of a couple of them, we're still working on them," Mattis added. An extension of troops could focus on California, given the thousands of migrants waiting in Tijuana across the border from San Ysidro. Some migrants could be in Tijuana for weeks, if not months, as they wait to apply for asylum. 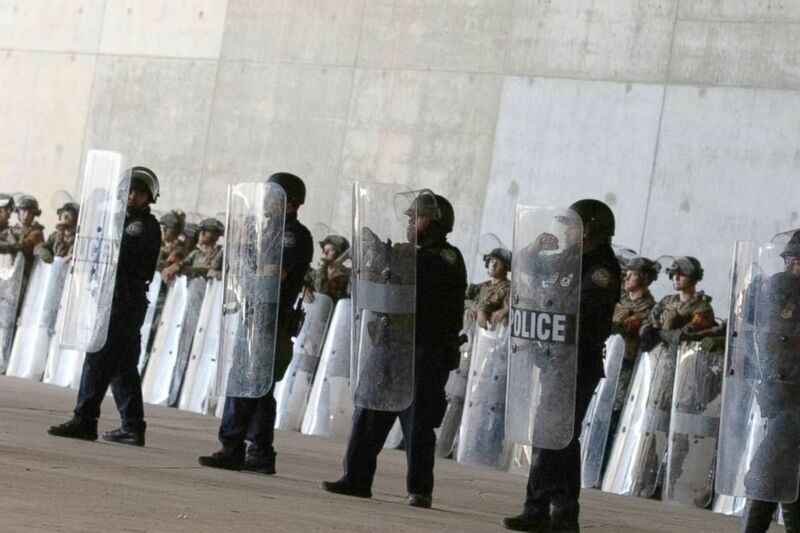 Over the weekend, a group of migrants attempted to illegally cross the U.S.-Mexico border near the San Ysidro port of entry, prompting Customs and Border Protection (CBP) agents to use tear gas and close cross-border traffic for several hours. Mattis has stressed that Military Police units deployed in California are primarily acting as backup for those CBP agents. They are not armed and cannot act in a law enforcement capacity, he has said. Earlier this week, the Pentagon announced that 300 troops who were assigned to the border in Arizona and Texas were moved to California after assessments from CBP. There are now 5,600 troops in support of CBP on the southern border, down from 5,800 last week and a peak of 5,900 earlier this month, with 1,800 of those troops located in California. The Pentagon has estimated that the border deployment will cost $72 million through Dec. 15.